As the fleet of sailing superyachts and motor yachts gather for the annual Loro Piana Caribbean Superyacht Regatta & Rendezvous – organised by the Yacht Club Costa Smeralda and Boat International Media – the docks of Virgin Gorda are buzzing with anticipation. The fleet covers a vast range, from the 22.4 metre yawl Bolero and the 24 metre Bloemsma sloop Drumfire to the giants – including the 54.6 metre ketch Marie, the 53.8 metre Parsifal III and Seahawk, which at 58.6 metres is the largest yacht taking part. The regatta is also the racing debut for Royal Huisman’s stunning ketch Wisp, and sees many regulars return with Ganesha, Inoui, Freya and P2 all competing once again. There’s good reason for the buzz on the dock. First, the weather forecast looks ideal, with a consistent 20 knots blowing in from the east predicted to stay till the end of the week. 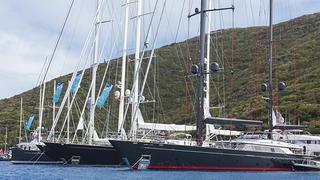 Second, this is the first regatta to use the Offshore Racing Congress’s new ORCsy superyacht rating rule. Based on a velocity prediction program model (VPP) but with adjustments via a dynamic allowance factor (for example, to account for one yacht taking longer to tack than another because of the need to furl the genoa), ORCsy aims to be the most accurate, and fairest, rating rule yet. The yachts each have a number of rating numbers based not only on three different wind strengths, but also on whether the sea state is flat or rough. The yachts are sent off one by one with the slowest rated yacht going first, and to specific timed gaps which should mean that all the yachts in a Class cross the finish line at the same time. This also means that each yacht can see exactly how it is doing against the others on the water – perfect for the competing superyacht owners and their guests.